When I was first learning the game of backgammon, I bought a copy of one of the few books then on the market, which I was told would give me the basic rules and an idea of the opening moves. It was true: the book explained these, but that was all it did. I learned the rule, played a few games, and quickly lost interest, just as I had years before in checkers. Quite frankly, I could not understand any of the feelings of excitement I had been told existed for the game. One evening a few weeks later I went into Knickers, a pub I frequent, for dinner. From one of the booths I heard dice rolling, and so I stopped to investigate. 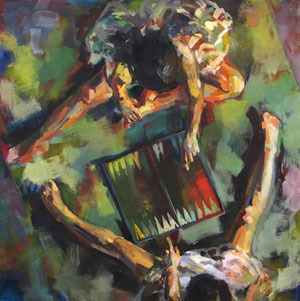 There, playing backgammon, were the owner and a friend, and they were playing the game I thought I had learned. But in fact my game bore very little resemblance to the one they were playing. Their dice were continually spinning, the checkers moved faster than I could comprehend the moves, the doubling cube — an indispensable aid to nail-biting games, and which I had read a definition of but didn’t understand — kept increasing in amount. The excitement, even of the spectators, was like that I had experienced at the craps table in Vegas or the roulette wheel in Monte Carlo. It just was not the same game I had learned. Now there was a vitality, and excitement, a life to the game and the players that permeated the air. I suddenly realized that I was watching not merely a game for sport, but a gladiators’ contest, in the full sense of the world: these men were going for the jugular; they were playing for blood! For five hours I stood there, entranced. I forgot dinner. I forgot to walk my dog. I forgot sleep. I was hooked. I have since learned the game the real way — the way it has intrigued and excited and thrilled players for thousands of years. And now that I can play the game the only way it should be played, now that I know five-hour sessions of enchantment are the rule and not the rarity, now that I know there is always a winner and a tie is impossible, I am even more hooked. And that’s what I want you to be, too — hooked — which is why I have written this book to help you to play backgammon in the same fashion — that is, for blood. That attitude is how this book differs from any other written on backgammon today. I am not concerned with the “sport” of the game, for any game is, of course, a sport in that sense. I am concerned with making backgammon that much more fun for you if, in addition to the sport of it, I can help you to win; it is perfectly obvious that the fun of playing is not as great as the fun of playing and winning. And, whether the stakes are money (in my opinion, they should always be) or the admiration of the spectators (and, in particular, a particular one), winning is always the better way to play. A lot has been written about the luck of backgammon, mostly having to do with the fact that dice are used to determine the play. Much has also been written about the luck of dice and what can, should, or can’t be done about it. 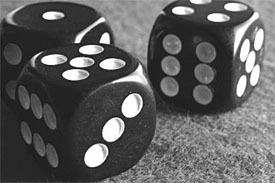 However, nothing about the luck of the dice has been written by the only consistent winners at dice — the casino owners. The reason is simple: they know there is no such thing. To these people, for whom the craps tables are the cornerstones of their gambling empires, the “luck” of the dice is meaningless, for they know that luck is for losers. This is because they depend completely and solely on a science: the science of probability. This is what consistently determines winners at dice, or in games based upon dice — not luck. Do you want proof? Have you ever heard of a casino operator going bust? In a short burst of play, of course, luck can be meaningful. There is no question but that a fairly good player can often beat a so-called expert; we have all seen those games where a bad move is suddenly converted by what would otherwise be a poor throw into a stroke of genius. And, sometimes, when his dice are running hot, game after game can be won by the lesser player. There are days when you shouldn’t have gotten out of bed, and there are others when you can do no wrong. But over a period of time (for once you know backgammon, you will play frequently), the luck will average out, and the laws of probability will take over, with this mathematical science inexorably governing the net results. However, I even have some tips to help you through those periods when luck seems to be going away from you, and help you take advantage of it when it’s with you. Nor do you have to be a mathematical genius to understand or apply any of this science — you can utilize it fully if you can count up to 36! Further, there are two advantages in the application of the laws of probability that you have in backgammon which do not exist in craps, both of which help you considerably. For one, in craps the player has to declare himself before he throws the dice. He makes his bet, then waits for the laws of probability to wipe him out. In backgammon, the reverse is true. The player throws his dice, and after studying his position, planning his strategy, and anticipating the probabilities his next throw involves, then makes his move. This leads to the second important difference, which is of the essence in the practical strategy of the game: before making his move, the player can utilize the same laws of probability to anticipate his opponent’s next throw of the dice, enabling him to make his most advantageous move with this knowledge in mind! It is these laws of probability, and their specific application to the game of backgammon, that this book presents, so that you will always know what strategic moves to make, and why; so that you will not need to depend on the fickle and ephemeral luck; so that you too can play backgammon for blood — and win. 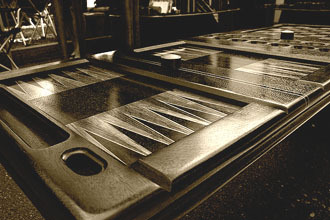 If you are a beginner, relax: backgammon is not a difficult game to learn. On the contrary, it is extremely simple, But its simplicity is deceptive, and in fact it is the complexity of the contest after you learn the rules of playing that makes it so continually fascinating. For example, the rules for moving men couldn’t be simpler, yet in the first two moves of the game — the opening and the response — over 100,000 combinations of moves are possible! This is a true figure, almost incredible in its scope, and fun to know — but thoroughly useless. In practice, there are 21 combinations of the dice that govern you move. I will give you what I think are the best openers for each and tell you why I have chosen them, based on the laws of probability and the strategy I advocate. As for the responses, if I am to suggest only the preferred response of each throw to each opener, I would have to give you 441 separate responses — a task beyond both this book and your desire. Instead, I will give you the principles of probability that will help you make the best response, as well as some specific and pertinent hints. You can see that, with this kind of complexity in the opening two moves alone, backgammon can be continually exciting in its changes and challenges; and you can also see why you will need all the help you can get. To get the most out of this book, I urge you to take out your set and arrange the moves as they are described. This will help fix some of the principles in your mind on the visual level. It may help even more if you work with a partner in plotting out some of the intricacies; it is surprising how much a discussion will add to your knowledge. The notation system I use to describe moves is simple: the points on your opponent’s board are called B1 through B12, and the points on your board W1 through W12. Finally, you will not become a great backgammon player simply by reading this book. You will have to play and play and play, learning, applying, and possibly adapting the principles I recommend here. I have found, however, that the best motivation to help you become a good player is to play for money. 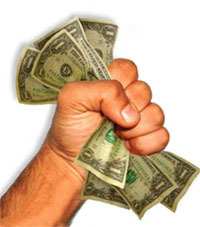 There is nothing like losing a few dollars because of a stupid mistake to keep you from ever making it again.